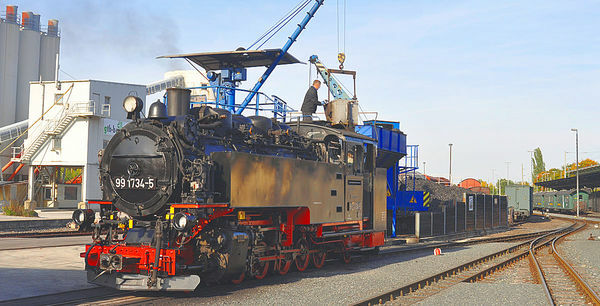 The Weißeritztalbahn, running from Freital-Hainsberg to Kipsdorf in the Eastern Ore Mountains, is one of Saxony's oldest narrow gauge railways offering a public service. 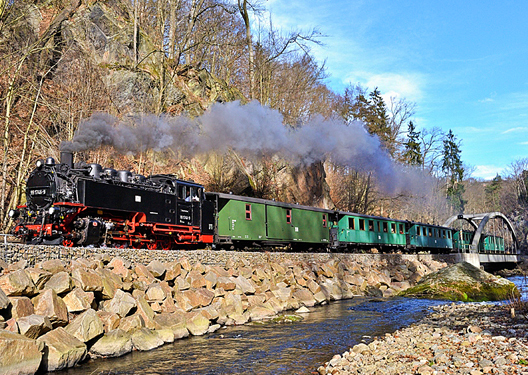 As early as in 1883, steam locomotives hauled trains every day through one of the region's most romantic valleys - the valley of the Rote Weißeritz river. 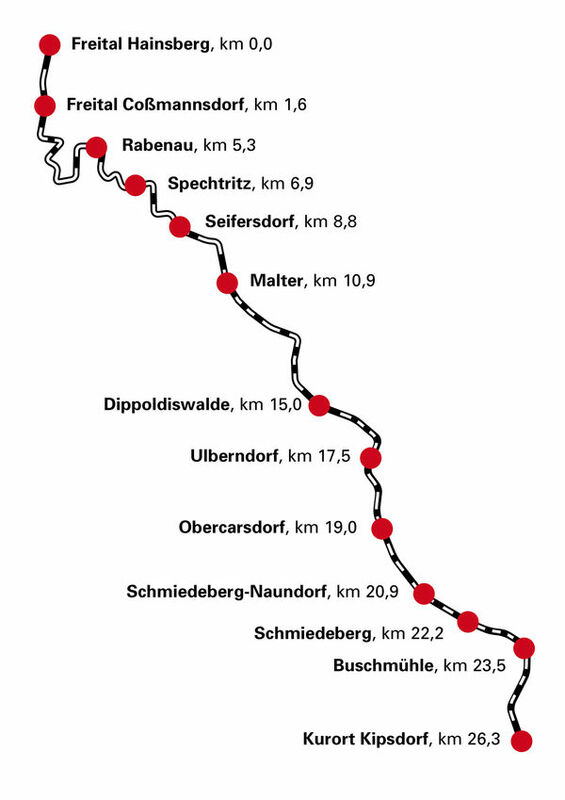 The route attracted public attention in August 2002 when it was severely damaged by the "Jahrhunderthochwasser" (flood of the century). After extensive reconstruction, the 15-kilometre-long part from Freital-Hainsberg to Dippoldiswalde is once again in use, with the section to Kipsdorf being reopened soon. The Weißeritztalbahn connects three different natural regions; thus, for its landscape diversity, it is regarded as one of the most beautiful routes in Europe. 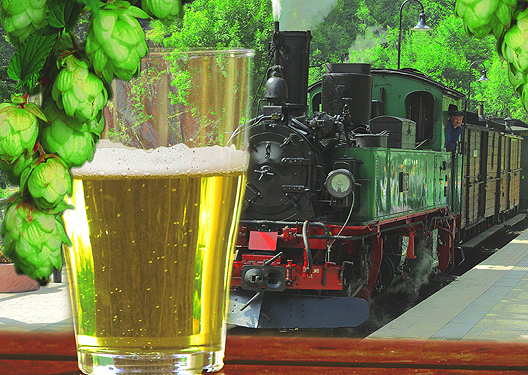 First, the train plunges into the wild, romantic Rabenauer Grund valley, a picturesque hiking destination. Continuing its route always along the Rote Weißeritz river and over numerous bridges, the train reaches Rabenau station where the long-standing "Rabenauer Mühle" restaurant and hotel awaits train passengers and hikers. The small town of Rabenau is known for the long tradition of its chair-making craft. A visit to the "Stuhlbauermuseum" (chair-making museum) will give you a lively picture of the craft tradition. After continuing your train journey for a few kilometres, you will leave Rabenauer Grund valley in the village of Malter where you will see Malter dam. A unique recreation area ideal for swimming and water sports is located directly next to Malter station. After passing the extensive dam, you will soon see the picturesque town of Dippoldiswalde (in the Eastern Ore Mountains) through the train window. After arriving at the destination station, the Old Town, with the Lohgerbermuseum (tannery museum) and the castle housing a gallery on the Eastern Ore Mountains, will await you. The narrow gauge festival taking place every year on the first Sunday in Advent is a special attraction for the whole family. 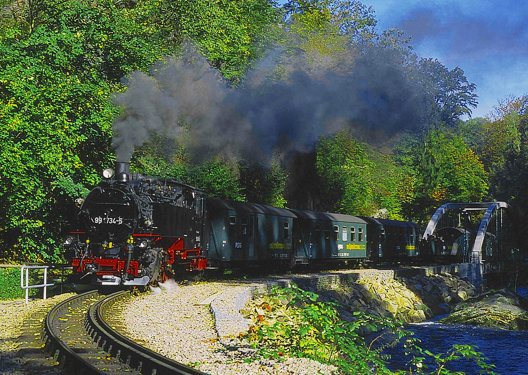 Another great experience is the "Braumeisters Dampfzug" theme tour on the Weißeritztalbahn route. Offered on selected riding days, it introduces the art of brewing and traditional craftsmanship in the Eastern Ore Mountains to you. The Weißeritztalbahn south of Dresden is located on the edge of the Ore Mountains. To reach you is easily accessible by train through the station Freital Hainsberg on the railway Dresden - Chemnitz - Zwickau (KBS 510), here there is a direct connection from the S-Bahn Dresden and the regional trains from Chemnitz to the trains of Weißeritztalbahn. It is also possible to travel from Dresden to the Freitaler A city bus line. This stops at the stations Freital Hainsberg and Freital Cossmannsdorf near the station. Information on the timetables of trains, trams and buses is available online at the Upper Elbe Transport Association (VVO). 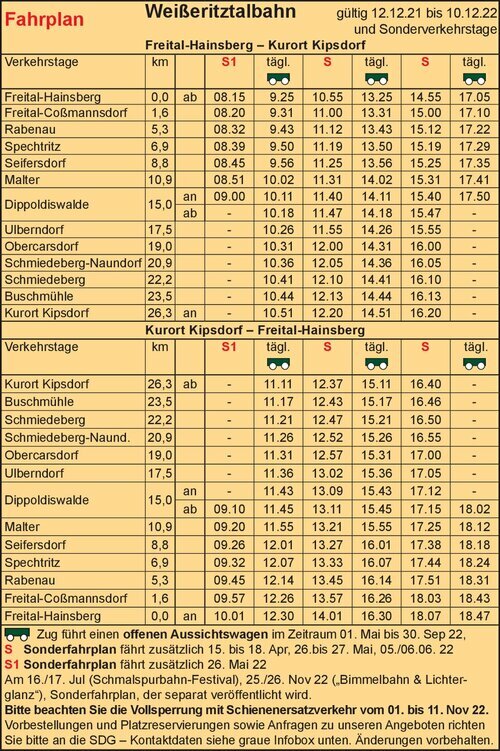 For those arriving by car, the trip over the S194 to the station Freital Hainsberg is recommended, before the station has sufficient parking available. The Weißeritztalbahn runs daily with steam trains.